Career advice for young journalists: Don't take Felix Salmon's career advice. 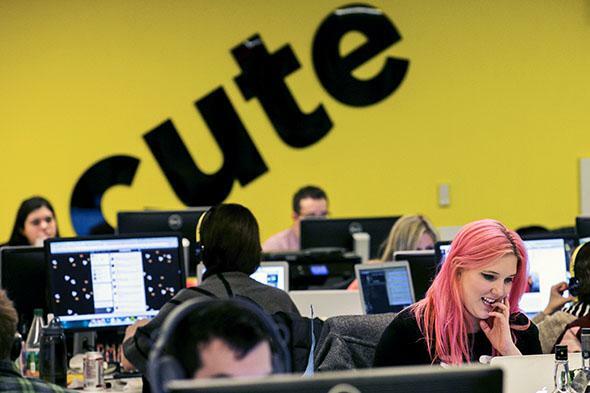 As old models falter, startups like BuzzFeed are finding new ways to subsidize journalism. If you are a young journalist who can’t imagine doing anything else with your life, Salmon’s post is well worth reading. He’s right that journalism is a rough way to make a living. (It has never been otherwise.) He’s right that the industry is changing in ways that make the old paths to success less reliable. But I think he’s wrong to imply that young journalists today don’t have a chance, and shouldn’t try. They do, and they should, and they will. That doesn’t mean that life is good for journalists. In fact, life is not good for journalists. And while a couple of years ago I harbored hopes that things might improve, those hopes have now pretty much evaporated. Things are not only bad; they’re going to get worse. There are two main reasons the journalism business is getting tougher, Salmon says. It’s worth emphasizing here that Salmon is explicitly addressing the liberal-arts-grad types, presumably because they’re the ones who most often send him letters seeking advice. Clearly he would agree that greater diversity would be a good thing for the industry as a whole, and for those who had previously been shut out. The second problem is the “platform revolution,” which Salmon acknowledges is a rather amorphous concept. Basically, he believes online media’s emphasis on technology has devalued human talent, turning journalists into “easily replaceable cogs in the machine.” As a result, Salmon says, capital has gained the upper hand on labor in journalism, as in so many other fields. It’s true that competition in journalism is more intense than ever, for the simple reason that the Internet has given readers (and advertisers) more choice. This has put pressure on media organizations to reach wider audiences with tighter payrolls. As a result of this shake-up, the old ladders to success in journalism—start out as a reporter on a local beat, work your way up, and settle into a comfortable career as a senior writer or editor at a metro paper or network affiliate—have crumbled. No longer do experience, age, and the respect of your colleagues guarantee a succession of promotions and raises over the years. What media organizations pay for now is productivity, and they’ll happily trade a well-compensated veteran with a weighty résumé for a cheap, tireless newbie with a Twitter following. It’s tempting to conflate this trend with a devaluation of human talent. But I don’t think that’s quite right. What’s being devalued are credentials like seniority, experience, and prestigious liberal arts or journalism degrees. (Local knowledge is also, unfortunately, being devalued, along with local news in general.) Talent still matters, however. In a world where any given news story has the potential to go virtually unread or to go viral and reach millions, the ability to find, report, and write stories that do the latter has become immensely valuable. If the “platform revolution” had made journalists interchangeable, we’d expect to see the hot new media startups filling out their staffs with unproven rookies willing to work long hours for peanuts. That may have been the trend five years ago. But the industry quickly came to understand the trade-off between quantity and quality. Instead, today’s hot journalism startups are splashing venture-capital money to lure rising stars from their more established rivals. BuzzFeed is stealing star reporters from the New York Times. Vox was launched by a team of high-profile defectors from the Washington Post (and one from Slate). Fusion, for that matter, has outbid the Atlantic, New York Magazine, Wired, and Reuters for whip-smart writers and editors like Alexis Madrigal, Kevin Roose, Daniela Hernandez, and Salmon himself. There is no candy-coating the reality that competition in journalism, as in other fields upended by the Internet and globalization, has hollowed the industry’s middle class and made careers less secure. This is very bad for incumbents who have paid their dues only to find that their dues no longer count for much. It’s also bad for young journalists who were hoping for a career in which paying one’s dues would guarantee future financial security. As Salmon points out, the youngsters who are replacing well-paid veterans today could find themselves on the other end of that equation in 20 years if they aren’t careful. Even more worrying, from a public-interest standpoint, is the upending of the business model for local news and local investigative reporting. And from a career standpoint, this means that it is far harder to find good work as a journalist in cities like St. Louis, Minneapolis, or Philadelphia, which once hosted thriving metro newspapers packed with enterprising reporters doing valuable work. The concentration of online media in pricey coastal hubs like New York poses additional obstacles for journalists looking to raise a family. But as old doors slam shut, new ones are opening. To the extent that white men with liberal arts degrees are losing their monopoly on journalism jobs, that can only be good news for everyone else who aspires to be a journalist—women, people of color, people without fancy diplomas. (The Gawker example Salmon cites makes it clear that this change is transpiring more slowly than one might hope, but that’s a subject for another story.) And while online journalism has recently clustered in a select few cities, the ease of working remotely should allow more of tomorrow’s journalists tomorrow to live wherever they choose. Slate, for example, has writers and editors living in Ohio, Georgia, Iowa, and tiny Viroqua, Wisconsin (population: 4,362). A world in which productivity trumps credentials should also be welcomed by those who are willing, or even eager, to be constantly judged on the value they’re creating today, rather than the names on their résumé or the number of years they’ve served in the industry. The middle is getting squeezed, but there have never been more opportunities to rise quickly to the top. Ta-Nehisi Coates, perhaps the country’s finest columnist, is 39. The BuzzFeed editor in chief who interviewed President Obama today is 38. Vox’s top editor is 30. (Here’s his career advice, if you’re interested.) An industry that increasingly selects for creativity, agility, and the ability to build a personal following will prepare the survivors to adapt to the next wave of changes more readily than their predecessors. A career in journalism has never been for the faint of heart, and it’s less so now. It’s becoming more like a career as an artist or novelist, in which the odds of financial success are stacked against any given entrant—but the nonmonetary rewards remain great. Those who make it end up with jobs they cherish. And even those who don’t make it will find that the skills they’ve gained are in demand elsewhere, including the relatively remunerative fields of marketing, advertising, and public relations. Salmon is right about one more thing—that journalism is changing fast, and we can’t predict what the industry will look like tomorrow. What this means to you, young journalist, is that you can’t look to people like Salmon, or me, to tell you how to make it in this business—let alone to tell you that you can’t. For all we know, the journalism industry 20 years from now may have constructed new ladders to success as reliable as the ones that existed two decades ago. Or perhaps the ladders aren’t coming back, and the industry will remain hyper-competitive and tumultuous. Either way, there will be some journalists who succeed in shaping the business’s future and make a good living in the process. They will be the ones who accept the premise that nothing will come easy—and reject the conclusion that it isn’t worth trying.